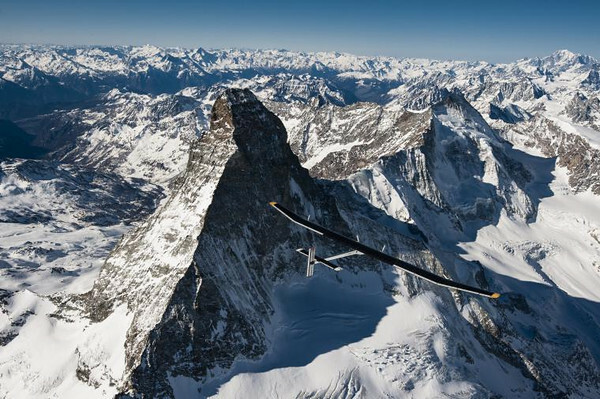 The last year has been a very busy one for the Swiss-based project known as Solar Impulse. Apart from successfully completing a two-month mission to fly across the US using a 100% solar-powered airplane — the first of its kind (able to fly through the night) — they’ve also been building a new and improved prototype plane. Bertrand Piccard, a doctor, psychiatrist, and aeronaut, is perhaps best known for being the first person to fly around the world nonstop in an aerial balloon. André Borschberg is an engineer and professional airplane and helicopter pilot who flew in the Swiss Air Force. Both Piccard and Borschberg take turns piloting the aircraft, which has a cockpit that only fits one. The success of Solar Impulse in flying a zero-emissions airplane is an encouraging step in the direction toward a movement of clean energy technology and being less dependent on fossil fuels. 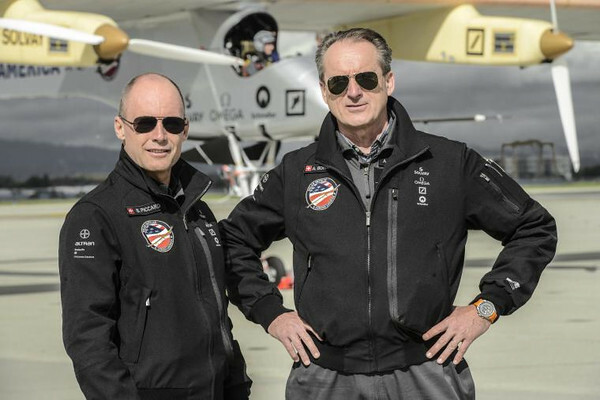 I caught up with Piccard and Borschberg to ask them more about Solar Impulse and their upcoming plans. TL: First of all, congratulations on the ongoing success of this revolutionary endeavor! How did it all start, and when? BP: The Solar Impulse program started off with the aim of building an airplane capable of flying night and day without fuel, propelled solely by solar energy. After the success of the first historical 26-hour flight in 2010 and the crossing of the USA in 2013, our goal is to fly around the world in 2015. Our success, however, will not only come from completing a round-the-world tour without fuel, but will also motivate everyone to implement the necessary measures to reduce our dependence on fossil fuels. Can you tell us a bit about the plane you use? How is it different from other solar-powered aircraft that have been developed in the past? AB: The airplane captures all the energy it needs from solar cells. These cells convert the sun’s rays into electricity to be able to simultaneously power the engines and recharge the batteries so that the plane can fly throughout the night. The amount of energy collected is relatively modest, and we had to carry out a lot of research to minimize consumption. The project is therefore primarily a demonstration of energy saving that can be achieved with currently available technologies. How long can the plane be flown before running out of energy? AB: Solar Impulse has been designed and built to collect enough energy in the batteries during the day in order to fly through the night on this energy until the next sunrise, when the pilot will be able to switch on the solar generator to produce energy and continue the flight. Each flight is well prepared by our team in order to never run out of energy! The plane is capable of flying several days and nights in a row without fuel, thus making the concept of perpetual flight more realistic. Solar Impulse is more than just an airplane, isn’t it? Bertrand, you have said that: “Our airplane is not designed to carry passengers, but to carry a message.” Can you explain what that means? BP: Our message highlights the importance of a pioneering and innovative spirit, especially in the domain of clean technologies. Nowadays, the technological solutions that allow Solar Impulse to fly both day and night are accessible to all and are replicable in everyday life. These are not secret, futuristic technologies. If they were used routinely in our society, we would be able to save 50% of our consumption of fossil energies and to produce half of the rest with renewable energies. 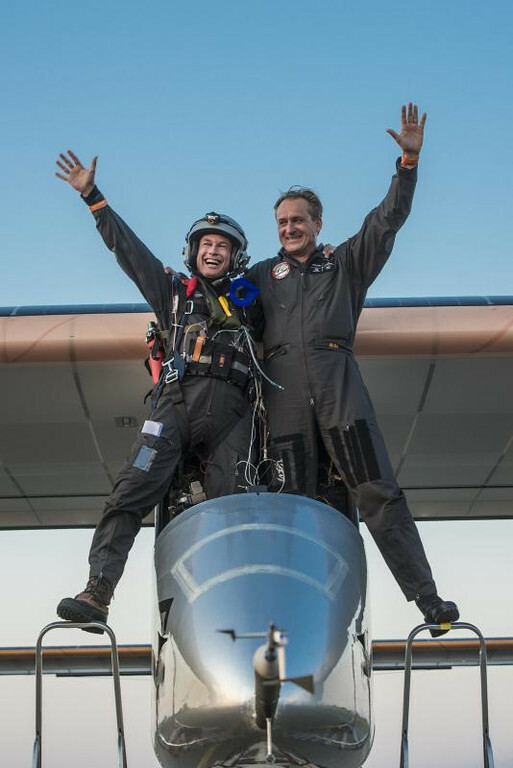 Solar Impulse wants to emphasize the energy solutions as well as the environmental and political solutions from a decidedly constructive angle in order to engender enthusiasm and the necessary motivation to leave behind this pervading fatalism. Aviation makes you dream, feeds your passions. A plane that flies without fuel and achieves something everyone imagined impossible will fire our imaginations. You are currently building a new aircraft, the HB-SIB. What does this stand for, and how will this prototype improve upon the existing model — the HB-SIA? Firstly, we want improved performance — that is to say, we want to reduce our energy consumption and have more reserves. Then, we’re modifying the cockpit to improve ergonomics. In addition, we need a more reliable aircraft with redundant safety systems and leak-proof electrical circuits in order to fly in humid conditions. Finally, we will have a form of autopilot, that we call Stability Augmentation System (SAS) which will maintain flight attitude and a directional heading so that the pilot will be allowed to rest. How will the around-the-world flight in 2015 be done? BP: The World Tour will take place over several stages with 2-3 day flights over the continents and 4-6 days over the oceans. We will take turns at each stop. The route is not fully defined yet. It is now studied using simulation models developed by our partner Altran and our meteorologists. The main stages will include Europe, a country in the Gulf, India, China, Hawaii, and the USA returning via Europe or North Africa. In what ways are you preparing for this? AB: We both took up the challenge of staying at the controls of the flight simulator for an uninterrupted period of 72 hours needed for a virtual crossing of the Atlantic. To draw all the lessons from this experiment and measure our mental and physical condition in real time, a whole battery of tests was performed by the Solar Impulse team in cooperation with experts in every field. Fatigue, cockpit ergonomics, nutrition, use of the toilets, exercises to prevent thrombosis, vigilance, and the ability to pilot the aircraft in a state of sleep deprivation were all assessed. This preparation will be followed by a program of test flights and training around Payerne airfield (Switzerland) in order to learn how to fly the new airplane. Due to its immense size and extreme lightness, Solar Impulse 2 is very sensitive to turbulence and wind during takeoff and landing. This spring, we will also realize a virtual round-the-world flight through simulation, in order to know if we will be able to maintain the aircraft in good weather conditions. What safety precautions do you take when piloting the plane? Do you wear a parachute? BP: We always embark with a parachute, a life raft, and a survival vest with military standard equipment. We need to be prepared in case we face an emergency situation with no other option but for the pilot to exit the aircraft. How do you deal with the weather? AB: To avoid turbulence caused by thermals, the aircraft must take off and land early in the morning or late in the afternoon. The surface wind must be less than 10 knots (~11.5mph) and the crosswind 4 knots (~4.6mph). To guide us and choose the best weather window we have a mission team, composed most importantly of Altran engineers who are highly specialized in trajectory simulations, and two brilliant meteorologists from the Royal Institute of Meteorology: Luc Trullemans and Wim De Troyer. Luc has already guided Bertrand during his round-the-world balloon flight; he is an exceptional router. They will guide the pilot during turbulence, find favorable winds, good altitudes, and sunny areas. The entire team will play a key role in completing the world tour. What are some inconveniences of solo-piloting the plane for so many hours that people might not think of? How do you go to the bathroom?? BP: The resting strategy and the vigilance are very challenging. There will be no sleep over populated areas, and we have developed techniques for resting our bodies while remaining awake. I personally use self-hypnosis techniques, whereas André uses yoga techniques. Above the oceans, sleep will be allowed in short naps of a maximum of 20 minutes since the second plane, planned for the world tour, will be equipped with a form of autopilot that we call Stability Augmentation System, and will allow us to keep flight attitude and a heading. In case of emergency, like if turbulence were to destabilize the plane, vibrating sleeves will wake up the pilot by showing him the direction and the tilt to correct. Regarding bathroom, we have toilets integrated in the seat. Do you think that solar-powered planes will be the future of commercial air travel? BP: We will surely see small solar seater planes soon. We do not foresee solar-powered commercial aircraft in the near future, but we must remember the past. In 1903, when the Wright brothers succeeded in flying their airplane over a distance of 200m, could they imagine that 24 years later, Lindbergh would cross the Atlantic Ocean solo? And 30 years later, airliners would carry 200 passengers, completing the same journey in eight hours, while two men walked on the moon! For more information on Solar Impulse, and to keep updated on their 2015 around-the-world preparations, check out their website: solarimpulse.com.